You may not recognize Donald Featherstone’s name, but you’re definitely familiar with his most famous work of art. 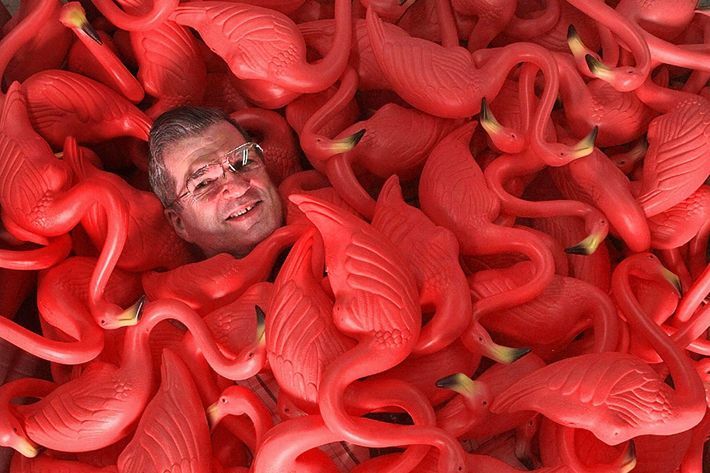 Featherstone, who died on Monday at the age of 79 in Massachusetts, is the creator of the pink plastic flamingo, the earworm of lawn ornamentation. Although the tradition of staking the bright, hollow birds in yards is a tad inexplicable if you think about it too hard, his influence is undeniable; the lawns of pop culture are populated with many a pink flamingo. He and his wife, Nancy, who confirmed his death to the Associated Press, wore the same outfit every day for much of their marriage. She would sew her own clothing and then make a matching piece for Donald. Whenever she saw flamingo fabric, she would buy it; they had over 40 matching flamingo outfits, which were kept in a special closet.